How is sexuality studied methodologically? How are we innovating, methodologically, in the study of sexuality? What impact, if any, has the increase in mixed methodologies had on the study of sexuality? Sexualities Research brings together original contributions by emerging and world-leading scholars of sexuality. Through this volume the authors seek to address how theoretical and methodological choices enable wider dissemination and social impact of sexualities research. 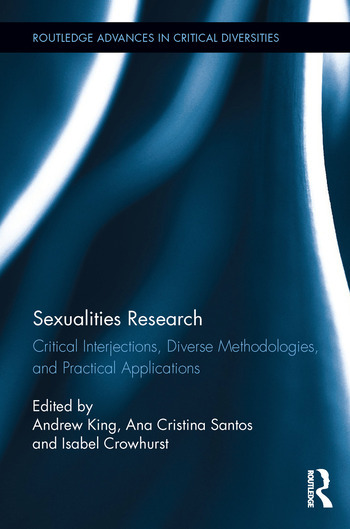 Indeed, covering a diverse range of theoretical perspectives and methodologies to provide important new insights into human sexuality, the chapters cover an array of topics from the experience of researching sexuality, to using theories in new and innovative ways. With an international scope, Sexualities Research also builds on the re-emergence of the European Sociological Association Sexuality Research Network and asks important questions about the study of sexuality in contemporary societies against the background of political upheaval and economic troubles. Certainly, this collection shows the importance and vitality of sociological understandings of human sexuality in the twenty-first century. An enlightening volume consisting of a variety of case studies and theoretical research, Sexualities Research will appeal to undergraduate and postgraduate students, as well as postdoctoral researchers who are interested in fields such as Sociology, LGBT/Queer Studies and Gender Studies. Chapter Six – Practice Theory and Interactionism: an integrative approach to the sociology of everyday sexuality? Chapter Seven – Making Space at the (Queer) Academic Table?